It's not wildly obvious, but you can make that window bigger. Here's it's natural state. Not that big if you want to scroll through all the records or fields. Just drag it to the right to make it wider, and up to make it higher. I'm not positive how it works on all OSes but it seems like it should. 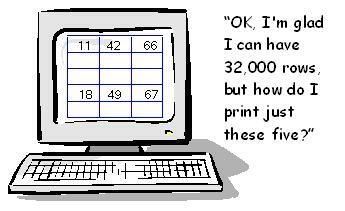 See also this post and this post on printing spreadsheets. In Word, I believe, and possibly other applications, you can drag the default page breaks to where you want them, in print preview. In OpenOffice.org Calc, there is no feature to do this in the page preview window. But there sure as heck is one in the Page Break Preview window. You can insert page breaks, and drag default or inserted page breaks to where you want them. Choose View > Page Break Preview. To turn it off, choose View > Normal. You can do this anytime, regardless of whether Page Break Preview is on. However, this illustration shows it on. Click on a row or column, and choose Insert > Manual Break. The appropriate selection will be available. Move your mouse over the page break and watch for the mouse pointer to turn into a two-ended arrow. Then drag it right or left, up or down. The page break will change position accordingly. If you drag an end or side page break into the document, then the column(s) or row(s) will appear as shown and they won't print. This is one way to control what prints, along with page ranges (select cells and choose Format > Print Ranges > Define for the first one in a document; Format > Print Ranges > Add for subsequent ones). this post and this post on printing spreadsheets. You're going along, minding your own business, doing your spreadsheet. You print. Ten minutes later the irate printer guy comes along, saying "Would you mind not printing 200 pages at once????" You're irritated since you just....well, you just MEANT to print the current sheet which has three pages. 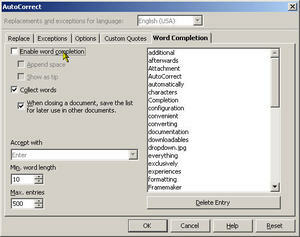 But when you click Print or choose File > Print and don't modify this in any way, you print the WHOLE spreadsheet. Possibly including blank pages. There are several ways to change this. Choose Tools > Options > OpenOffice.org Calc > Print. Select both options shown. Click OK. Now only the current sheet will print, and no blank pages will be printed. To do this on the fly for each time you print. 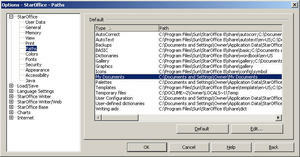 Choose File > Print, click Options, then set the options in the options window that appears. This will make the change only for the current print job. Click on the first sheet you want to print. 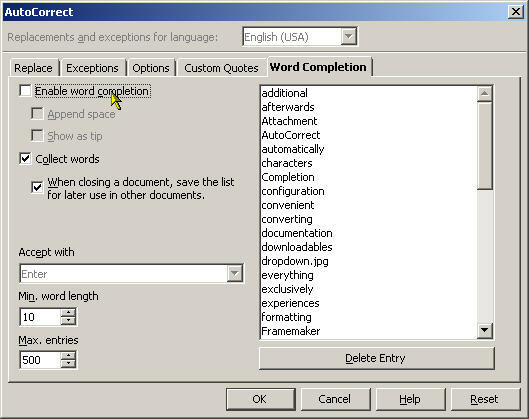 Then hold down Ctrl and select any other sheet(s). Or for contiguous sheets, click on the first sheet you want to print. Then hold down Shift and select the last sheet you want to print. 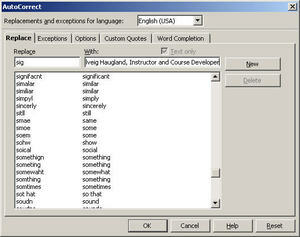 Lots of people complain that in OpenOffice.org you only get one page of labels from the File > New > Labels wizard. One way to get around that is to not enter the data manually; use a database and create a mail merge. Then you'll still just see one page in the label document but OpenOffice.org will print as many sheets of labels as necessary for the data. 1. Click here to create the mail merge. 2. Click here to create labels based on the mail merge. 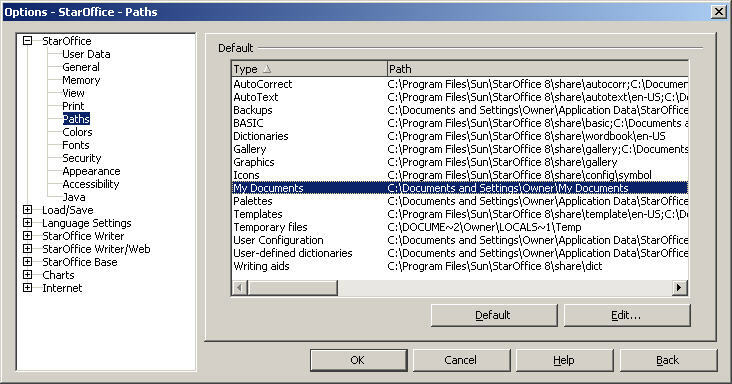 However, if you do want to manually type two or more pages of labels, here's what I recommend. Use the labels from WorldLabel.com. They're composed of invisible-border tables so it's easier to just create a new page, then copy the table and paste it onto the new page. For more detail on that, see http://www.freesoftwaremagazine.com/articles/free_open_document_labels?page=0%2C2 and find the section called Copying the first page to make additional pages. To see the whole article on using WorldLabel and regular label templates, click here. If you've done mail merges before, you've seen this message. What you should do, every time, is to click Yes and leave everything else alone. Then the mail merge will print with the contents of your data source. What would make sense is to mark the Do Not Show Warning Again checkbox and click Yes, thinking that every time thereafter you'll be able to print the mailmerge correctly, with the contents of your data source, just like you did this time, but without that pesky message popping up. You'd be logical, but you'd also be wrong because of the wacky design of the program. If you mark the checkmark, then from that day forward you will print, instead of a mail merge, a list of fields like <Firstname> and <Lastname>. How do you get that dialog box to come back so you can print a mail merge correctly? Answer: Here's how it's supposed to work. People say this works. I can't find a file with the relevant flag in it on my machine but if it works for you, great. It should work. 2. Find the Writer.xcu file. It's in one of these locations. 3. Make a backup copy of it. Just copy the file in your file manager and paste it somewhere else. 5. Look for <prop oor:name="AskForMerge"> and set the value to true. To do this, look for "AskForMerge=False" and type "True" where it says "False." Now you'll get the message popping up again when you print a mail merge. Leave the checkbox alone and click Yes, and you're golden. Calc spreadsheet printing can be tricky. Which is too bad, because there are some fairly powerful features. Here are some questions people used to ask me a lot at when I worked at Sun. Between horrified peeks at my under-water stock options, this is what I told them. My spreadsheet won't print the way I want. What should I do? There is a powerful and quite easily accessible tab that lets you do a bunch of stuff with printing. Choose Format > Page and click the Sheet tab. There, you will find many useful settings such as what direction to print in (all the way down then start again, or all the way across then start again), and which items to print (grid, formulas and much more). Possibly the most useful, however, are the scaling options at the bottom which let you make the whole thing fit onto a specified number of pages or let you scale the whole thing up or down a bit. The Page tab of that window can be useful too with more everyday settings—margins, page size, and centering the cells left-right and top-bottom within the page. Use the Table Alignment option for that last feature. I really don't want to show McNealy the figures in column G. How do I hide that? It's not tricky—not this approach to hiding, at any right. Select the whole column by clicking on the letter, then right-click and choose Hide. To show again, select the two columns on both sides, right-click, and choose Show. No, I mean I want to show them in the spreadsheet while I'm working with them, I just don't want that column to print. Oh, why didn't you say so? This is simple too. Select whatever cells shouldn't print, and choose Format > Cells. Select the Cell Protection tab. Mark the Hide When Printing option and click OK. (Remember to turn it back on again when you want them to be printed.) However, note that this won't make the cell spaces themselves go away. So hide the heading that goes with the data, and be prepared to answer questions about why that space is empty. How do I print just specific rows or columns of my spreadsheet? It's quick and easy, just not obvious. Select the rows or columns that you want printed. It has to be rows or columns, the shape must be rectangular. Then choose Format > Print Ranges > Define. Choose File > Page Preview to be sure you got what you want, if you want to check first. Then just print; only items defined in print range will be printed. If you made a mistake defining the range, repeat the step with the right range and the new range will replace the old range. Or just select the old range and choose Format > Print Ranges > Remove and start over. If you need multiple print ranges, it might be best to consider using one of the hiding features. I need the headings across the top, Budget and Forecast and all that, to print on every page. How do I do that? In the previous task, the window had fields where you could pick rows to repeat. You just use those fields. Choose Format > Print Ranges > Edit. Click in the Rows to Repeat (or Columns to Repeat field for columns). Just use your mouse to select the rows to repeat. Repeat with the other field if you want both columns and rows to repeat. Here's a picture of the key point. Click to get a bigger graphic. Choose File > Page Preview to check if you want to verify before printing. 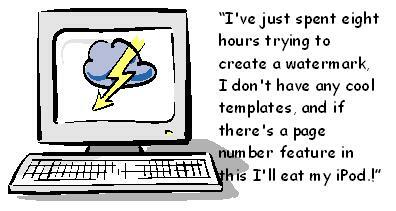 I was fiddling with a very large and ungainly spreadsheet this morning. Just bad setup, period. I was trying to figure out how in the world to keep track of what was supposed to show up in print preview, and what was actually showing up. Here's what helped. Use the Print Column and Row Headers feature. Choose Format > Page, click the Sheet tab, and under Print, select Print Column and Row Headers. Here's what the window looks like; click this and any other image if you want to see a bigger version. Here's what the spreadsheet looks like in Page Preview (File > Page Preview) with that option marked. Another handy option for readability is to print the grid. The option is in the same window; choose Format > Page, click the Sheet tab, and in the Print area, mark the Grid option. I've mentioned this before, but it bears repeating. You can repeat columns and/or rows on each page by using the print range feature. It's very handy to have that data repeat. Here's what a spreadsheet looks like without the feature, and with it. Choose Format > Print Ranges > Edit. Click in the dropdown by the Rows to Repeat and select User-Defined, then click in the field next to it. Then, in the spreadsheet itself, click on the cells of the rows you want to repeat. Click in A1 to repeat just the first row, for instance; select A1 and A2 to repeat two rows on every page. Do the same for columns. Click in A1 to repeat one column; select A1 and B1 to repeat two columns, and so on. Here's what the window would look like if you wanted to repeat two rows and one column on every page. You can also type, as you see: $1 for row one; type $1:$2 for rows 1 and 2. Type $A for column A; type $A:$B for columns A and B, type $A:$D to repeat columns A through D; and so on. This really helped me this morning with the unwieldy spreadsheet. Choose View > Page Break Preview. This is what a big view of the spreadsheet looks like in this view. Click it to see the screen shot full size. Here's a more focused view. If you have blank areas of the spreadsheet displayed, the page numbers might not match what's in page preview or what prints. However, the page breaks will be correct. When you want to go back to normal view, choose View > Normal. If you want to insert the page breaks manually, click to insert the break, and choose Insert > Manual Break > Row Break, or Insert > Manual Break > Column Break. You can set this by choosing Format > Page, clicking the Sheet tab, and making the appropriate selection at the top of the window. You will probably be in Page Preview mode a lot (choose File > Page Preview). You'll also spend time in the Page styles window setting various options in the sheet tab. You might think you need to close the page preview mode, then go to the page setup window by choosing Format > Page. You can, but it's much quicker to just click the Page button while you're in Page Preview. That'll take you to the page setup window. Change your options there, then click OK and you'll pop back to the page preview window, with the changes you just made reflected in the view. So: Choose File > Page Preview. And click the Page button below to go to the page setup window. March 2006: I've been having a bit of trouble getting some of my posts listed, so I'm reposting a couple of the ones I think are most important. This one is from back in November '05. For all spreadsheet posts, see this index page.